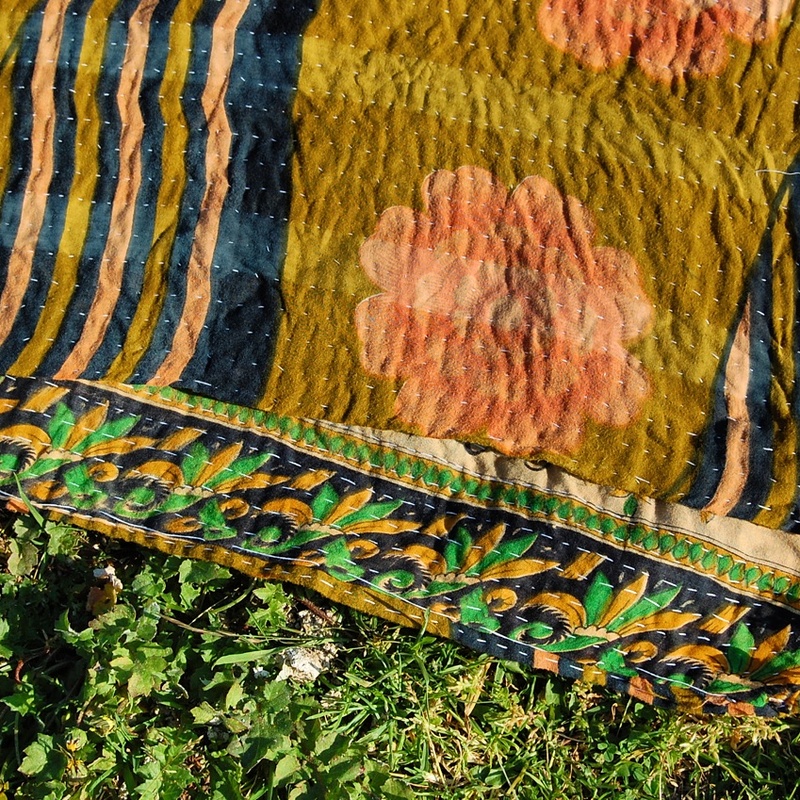 Vintage, handmade and often containing natural Indian dyes (such as turmeric), kanthas are one of the most eco-friendly, cruelty-free & sustainable quilts available. You can call Kanthas The Eco-friendly Quilts due to their composition of recycled & repurposed fabrics as well as their natural dyes. In place of synthetic dyes, India is known for using the spice turmeric as well as other natural dyes to create the wonderful earthy colours that are so abundant in their culture. (For more on turmeric dye, view our post here.) Superior to synthetic dyes which harm the environment with chemical waste run-off, turmeric comes from the earth and is returned to the earth. The longevity of the quilts themselves and their many uses adds to their positive impact on the planet = less production of new materials and products. Kantha production sustains small communities. There is a wonderful harmony in how giving new life to old sarees provides a livelihood for the women and artisans who create these stunning textiles. It’s important to support cultural traditions, so that we stay inspired. It’s raw, it’s real and it’s often what we need to remember the important things in our busy technology-crazed society. Not only is re-use an environmentally-conscious option, the kantha trade helps support small rural communities and keeps traditional craftsmanship alive. Historically and culturally, the kantha technique of re-using, repairing and carefully stitching is the beautiful solution to the limited availability of materials. The kantha has it’s beginnings in the home; the passing down of handmade kantha quilts through generations was an age-old tradition; a symbol of family, comfort and togetherness. Often, kanthas are made by women in Bangladesh and Calcutta’s slums, as well as in rural communities, giving these women the chance to be independent through their earnings. The Kantha Project seeks out kantha items that are fair-trade – providing work & livelihood for these women, as well as supporting the growth and development of small craft-smiths with fair work agreements. Cotton is a natural fibre and thus is perfect for someone who is allergy-prone, as there is no synthetic wading, nor does the vintage kantha contain wool, unlike many quilts. Supporting vintage gives life back to old products thus halting the excess production of new products and materials, ensuring no further animals are harmed. Buying vintage or pre-loved is the best way you can reject the exploitation of animals – because it’s hard to know the exact content and process of any given new product. Therefore, repurposing and re-using is highly regarded for it’s ethical standing. Kanthas don’t contain any wool products, unlike most quilts. And although silk is a common textile material used in India (and may be present within the kantha layers), we believe that all we can do is improve life for all (big and small) in our time. Since we can’t change the past, we’ll do our best to fix the present and future. As well as being one of the most sustainable quilts made from layers of cotton saree, because of the Indian embroidery design of the kantha stitch hand embroidery and vintage print textiles, these cotton quilted throws are always one-of-a-kind which makes them that much more special. They have quickly become the favourite hippie Indian tapestry. I’d never even heard of kanthas before coming across your site and I love that there are so many vintage options! I have many vintage pieces in my home and love up-cycling. How do most people use them – mostly as quilts or can they be used for other purposes? I picture one on the beach but would it be too heavy? Thanks for any suggestions! There are so many uses for kanthas, I had to write, not one, but many blog posts about them! Most people use them for the bed as a bedspread or throw – even for the sofa. Other great uses include; blanket, rug (for the thicker/heavier ones), picnic rug (one of my favourite uses), curtain, tablecloth, glamping decor, beach throw (yes, they work well at the beach, however it’s better to choose a very tight-stitch kantha, so the sand doesn’t get trapped within the layers), wall hanging, even a yoga mat.